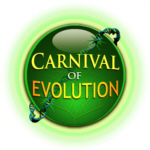 The Carnival of Evolution #50 is up! That’s right the Carnival of Evolution has reached the big 5–0 and it’s rarin’ to go with The Teaching Edition! So go with the flow and go, go, go on over to Marc Srour’s blog Teaching Biology! If you missed any of these you’ll definitely want to go check them out! Two more episodes from the excellent television series Inside Natures Giants are now available for viewing on YouTube. As I wrote in a previous post, this is a fascinating zoology program wherein the bodies of various large animals are dissected to demonstrate the details of their anatomy. This is combined with discussions of the living animals and their natural history with occasional incites from Richard Dawkins about evolutionary biology. A play list for the rest of the parts can be found here. I couldn’t find a play list for this episode so here are individual links to the different segments: part 2, part 3, part 4, and part 5. As before I really cannot speak more highly of this program. It is fascinating television for anyone with even the slightest curiosity about the natural world and a absolute must see for anyone interested in biology, zoology and evolution. I recently stumbled upon (on YouTube) a BAFTA award winning British TV series titled Inside Natures Giants and I’ve fallen in love. What we have here is a television show in which various large animals, all vertebrates so far, are dissected on camera (and often in front of a live audience of students) by a team of biologists in order to show the details of their anatomy while presenting elements of their physiology, natural history and evolution (including commentary by evolutionary biologist Richard Dawkins). So far the show has dissected an Asian elephant, a fin whale, a Nile crocodile, a Rothschild giraffe, a great white shark, a Burmese python, and most recently (unfortunately not yet available on YouTube) a two for one, lion and tiger combination. I’m hoping they work in a ostrich or emu in there sometime soon and maybe a giant squid or octopus to show some invertebrate anatomy as well. These programs deal with the dissection of actual animals in graphic detail so if you’re squeamish at all you might find them difficult to watch, however this show is an absolute must see for anyone interested in zoology and evolution. Of particular interest was the dissection of the giraffe. Among the various interesting adaptations towards tree top browsing is a classic example of one of the cloven hoofprints of evolutionary history, the recurrent laryngeal nerve; the dissection of which has apparently not been done (according to one of the scientists in the show) in a giraffe since the 1830’s. A play list of all the videos available on YouTube can be found here, and I really cannot recommend them more highly. but there is a whole series of videos showing several different large animals being dissected while their anatomy, physiology, and how these evolved are discussed. 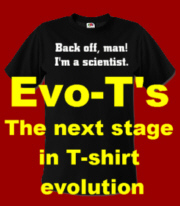 A must see for those interested in zoology and evolution. A commenter made a good point regarding something I said in one of my follow-up comments in the thread after my rant on intermediate fossils that I thought I would move up here to respond to. Oldfart: While you are at it, explain “primitive” and “advanced” traits. Since it is also often said that later is more advanced than earlier assuming some kind of “direction”. You’re right I should clarify this.